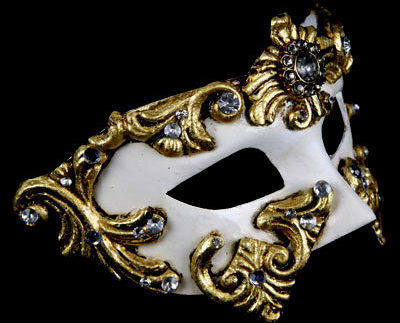 This elegant masquerade ball mask is painted in aged effect antique gold / white and adorned with ornate designs. 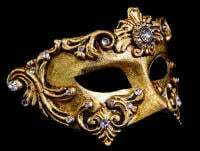 Faux diamond crystals bring a rich highlight to the mask........An extravagantly designed and handcrafted Venetian mask for men or women. 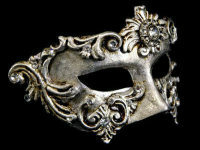 All ball masks are hand made and painted in Venice. No two masqierade masks are ever identical. Colours and patterns will vary slightly on each mask & please remember these masks are aged so do not look in as new condition.